Sinorice Moss at the New York Giants Super Bowl champions parade in NYC. Sinorice Travonce Moss (born December 28, 1983) is a former American football wide receiver in the National Football League (NFL) and Canadian Football League (CFL). He was drafted by the New York Giants in the second round of the 2006 NFL Draft. He also played in the CFL for the Saskatchewan Roughriders. Moss played college football at the University of Miami. Moss's older brother, Santana, is a free agent wide receiver formerly with the Washington Redskins. Moss played college football for the University of Miami Hurricanes, where he was a standout wide receiver. 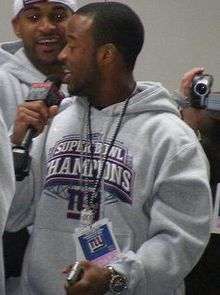 Before being drafted in the 2nd round of the 2006 NFL Draft by the New York Giants, Moss was rewarded MVP of the 2006 Senior Bowl. Moss was selected by the New York Giants with the 44th overall pick in the second round of the 2006 NFL Draft out of the University of Miami. The Giants expected to groom Moss to be their slot receiver in 2006 but his progress was marred by a recurring quadriceps injury, which caused him to miss training camp and limited him to five receptions during his rookie season in six games. In 2007, Moss played in 13 games, the year of Giants' Super Bowl XLII victory. After two seasons with the Giants that produced only 26 receptions for 230 yards and no touchdowns, Moss vowed to improve in the 2008 campaign. However, Mario Manningham and Hakeem Nicks, quickly surpassed Moss on the depth chart. Prior to the 2010 season, Domenik Hixon, who had taken the return job away from Moss during the 2009 season, tore his ACL and was placed on injured reserve. During the preseason, Moss competed for the return specialist job, but suffered from a sports hernia and on August 31, 2010 was placed on season-ending injured reserve. Moss was officially waived by the Giants on November 9, 2010 after reaching an injury settlement. Primarily because of injuries, he departed New York after a five-year career that included just three touchdowns. Moss was signed by the Philadelphia Eagles to a future contract on January 10, 2011. He was released on September 3 during final roster cuts. On April 24, 2012, Moss was signed by the Saskatchewan Roughriders. After playing in only two regular season games, Moss was released during the following off-season on March 8, 2013. Since retiring from football, Moss has quietly begun pursuing a career as an actor. Sinorice has one son, Sinorice Moss Jr.
1 2 3 4 Associated Press (April 29, 2008). "Giants' Sinorice Moss expects big year in 2008". Retrieved 2008-04-29. 1 2 Florio, Mike (November 9, 2010). "Giants say goodbye to Sinorice Moss". ProFootballTalk. Retrieved 2010-11-16.